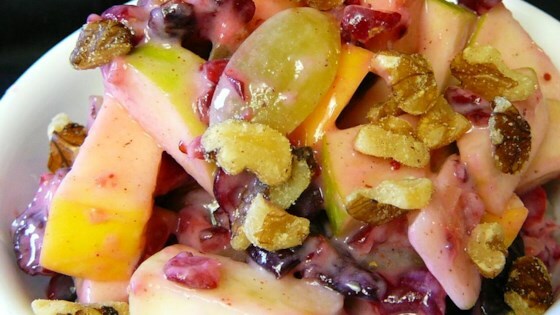 "I make this salad all year long, but it is especially great for Thanksgiving and Christmas. Just freeze a few bags of cranberries to use at a later date. I know this will become a tradition to anyone who tries it, it's delicious! Garnish with frosted cranberries and mint leaves, if desired. For frosted cranberries, wet cranberries with water, and roll in sugar." All of the different fruits together were very pretty but no one in my house, including me, liked the yogurt at all. Waldorf = mayo. This is really out of this world. I just loved it. Thanks for sharing. Good salad for adults. The fresh cranberries make the salad quite tart. I tripled the sugar and it countered the tartness. Overall hit with family during Thanksgiving. This recipe was great. Very quick and a healthy sweet treat. I didn't have the green grapes and it still turned out delicious! I know I'll be making it more. Thanks Thea! I followed this recipe to the t and it was perfect. And I can't stand crandberries.